Notice: In order to keep rounding errors as small as possible, it should be absolutely avoided carrying out a frame rate change from an already converted STL file a second time. Cole Prine on 15 Oct, 2008 at 4:49 PM (…) I found two of the greatest tools to have when dealing with subtitles and they are free! 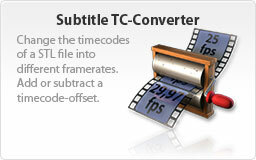 Subtitle Xtractor and Subtitle TC-Converter. (…) These are some great tools.